The house church leaders of the New Testament. A fascinating insight into the everyday life of the first-century church. 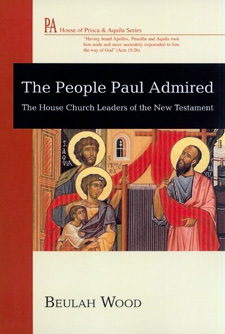 Beulah Wood examines the lives and lifestyles of early house church leaders at the time of Paul. Uniquely, she does this through first-person narratives delivered by historically-based characters such as servant girls and minor characters from the book of Acts. Carefully researched and creatively written - entertaining and informative. Published in USA by Wipf & Stock. Distributed in New Zealand by Castle. "Sometimes when we read the Bible we look at the men and women in its pages as little more than stick figures. In her book, Dr Wood wraps them in flesh and blood and we see the people Paul admired for what they were, real people who lived ordinary lives for an extraordinary cause." "A great series, interesting, informative, earthy, provoking group discussion and personal growth. Beulah Wood has made the early church come alive, and shown us how the kingdom affects every part of life."